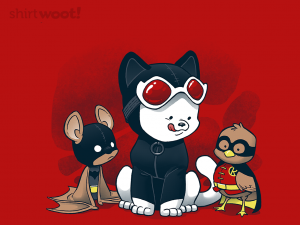 Okay, have you ever considered how adorable it would be to see all the Gotham characters as the animals they represent? I mean, okay, you can exclude Man-Bat and Killer Croc, ’cause they’re pretty much already there, but Catwoman? Penguin? …Robin? Okay, there aren’t a whole lot, but, still… This T-shirt represents how the Saturday morning cartoon of Gotham could go. Wrap it around your torso if you ever need a cute pick-me-up, but still wanna stay true to your Gotham roots.